Oh my, is it almost Christmas? It must be, because I’ve been subconsciously making Christmas crafts…and these adorable paper straw Christmas trees are one of ’em! Rebecca from Simple as That contacted me about writing a craft for her site. I thought why not do a kids Christmas craft for her. Kids crafts are my specialty, right?!? Side Note: If you are loving these kids ornaments, check out my roundup of easy-to make popsicle stick Christmas tree ornaments! I had a ton of decorative paper straws that I’ve been wanting to do something with. So I thought Paper Straw Christmas Tree Ornaments! 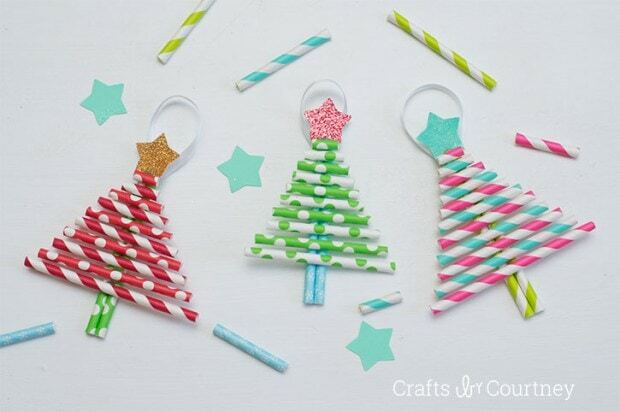 How cute are these paper straw Christmas trees? They’re simple AND beautiful ornaments! Learn to Make Paper Straw Christmas Trees!